Posted on April 23, 2018 by Scott Johnson in Democrats, Media, Minnesota, Who is Keith Ellison? I am sorry to repeat myself on the subject of Keith Ellison, but Ellison keeps repeating his lies. As vice chairman of the Democratic National Committee, he is a consequential national figure. In Minnesota, the Star Tribune sits in Ellison’s congressional district. It continues to avert its eyes from Ellison’s repeated lies. Who will call him on them? If you are a Black man from my generation, you remember the march. A huge number of Black men from all across America came to Washington to alert lawmakers to the social and economic problems facing our communities. I helped organize the march in my local community in Minneapolis. And I marched in it, along with civil rights leaders like Rosa Parks and Jesse Jackson. After the march, Mr. Farrakhan’s disparaging views on Jewish people, women and the LGBT community became clearer to me. I’ve since spoken about why I believe Mr. Farrakhan’s views ultimately divide our society. I wrote an open letter expressing my opinion of Mr. Farrakhan’s views, and I wrote about it in my book, My Country ’Tis of Thee. In a speech just last month he again attacked Jewish people with intolerant and divisive language. 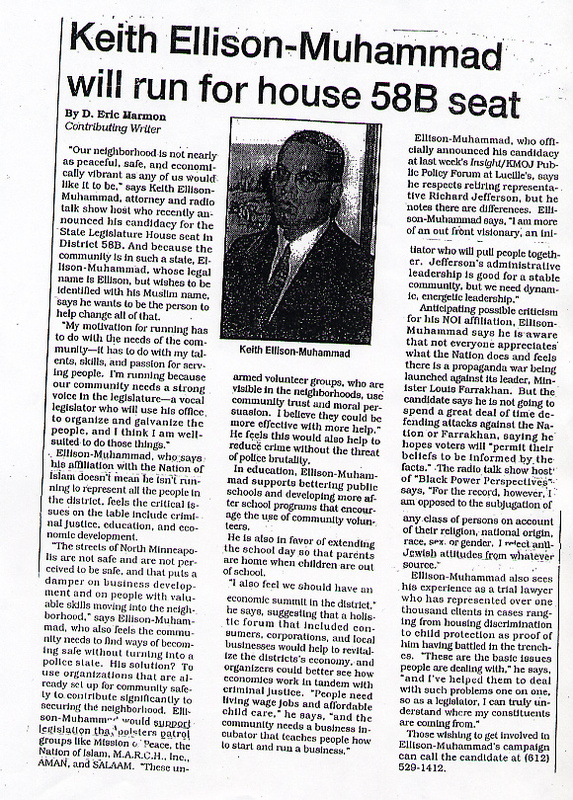 I documented the falsity of this story since Ellison won the DFL nomination to run for the Fifth District seat in 2006 in “Louis Farrakhan’s first congressman” (October 9, 2006), in the companion Power Line post “Keith Ellison for dummies,” and in “The Ellison elision” (February 3, 2014). From the time he hit the Twin Cities to attend law school until he first ran successfully for office, Ellison was a local leader of the Nation of Islam. Indeed, he first ran for office (unsuccessfully) under another Nation of Islam pseudonym (Keith Ellison-Muhammad, per the 1998 article above that appeared in the Minneapolis Spokesman-Recorder). At that time he sought office as a self-avowed member of the Nation of Islam. He was an enthusiastic member of the hate cult for a long, long time. Ellison’s repeated claims of ignorance are laughable. By the time he sought office again (successfully) in 2002, Ellison had apparently moved on from the Nation of Islam. He has relegated his time in the hate cult to the inconvenient past. Today Ellison is an inveterate liar.